Why Are My Houseplants Turning Brown? I adore houseplants, and my general decorating aesthetic is somewhere between “greenhouse” and “rainforest.” In other words, my attitude towards living green things is: the more the merrier. Which is actually kind of true – even science says so! 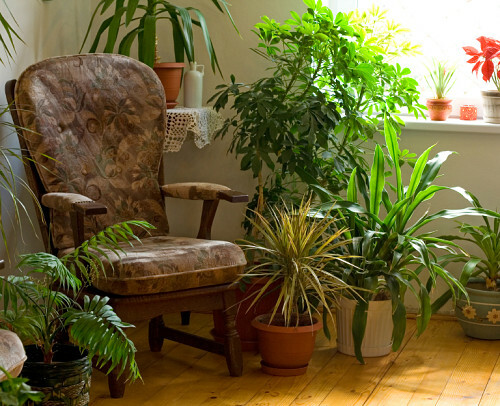 Houseplants help to clean the air of harmful pollutants, and they’re also known to brighten a person’s outlook. That’s a double whammy I’ll take more of, any time. These days I’ve got plants of all stripes, in all sizes, and on most of the surfaces in my home. Okay maybe that last part is an exaggeration, but you catch my drift. From succulents to orchids, tropical species to desert dwellers, flowers to ferns to everyone’s favorite standard, the ficus. And these days I keep them all thriving, even with their various needs. But it wasn’t always like that. There was a time, not so long ago, when I did not have a green thumb. If it was seeded, sprouted, or grew from the ground, well then I was bound to ruin it. Not intentionally of course. I was an accidental plant assassin, but the effect was the same. In my house, plants came in, but they didn’t come out. So I’ve learned a lot over the years, and among my friends I’ve kind of become known as the garden expert. Which is why a friend recently emailed me, and asked me why her houseplants were browning. “Why do house plants turn brown, even when you water them and give them ample light?” she said. It’s a great question. And although the cause could be one of many culprits, the good news is that the solutions are very simple. All you need to do is figure out which problem you’re needing to solve. 1. Do you water enough? Some people water daily or near-daily, but they only water a very little bit. This creates shallow roots and possibly incomplete water uptake. It’s better to flush the plants thoroughly, less often, but enough so that the water runs out through the hole in the bottom of the pot. 2. Is your home humid enough? Many plants, especially those hailing from tropical regions (which many houseplants do), are not equipped to handle the dry air caused by conventional cooling systems (like AC). To remedy this, you may need to keep a spray bottle handy and mist the plant every few days, in order to keep it properly hydrated. 3. Is your home too hot? During winter you might be cranking up the heater, and it may be too much for your fragile floral friends. Try moving them to a cooler spot – right next to a window, or in a corner of the kitchen perhaps. A spray bottle can help with this problem as well. 4. Is there an overload of minerals in the soil? This can come from over-fertilization, but may also be caused by minerals in the water. If your area has hard water or you use a water softening system in your home (which replaces minerals with sodium ions), you may want to buy distilled water especially for your plants. Some cities have naturally soft water, as plumbers in Seattle know very well. Find out from your municipality whether your city has hard or soft water. And if you’re a fertilizing fiend – cut it out! As you begin to figure out the issue and set about fixing it, make sure you’re helping your plant along in its recovery. Strip all the browned and dying leaves completely – they’ll never come back to life and as long as they’re on the plant, they’re gobbling resources. Make sure the plant is in a pot that has drainage holes, so that you can thoroughly soak the roots without leaving standing water. Be attentive, but not overly so. Plants are pretty hardy and they can handle themselves just fine, given the proper conditions. Good luck!